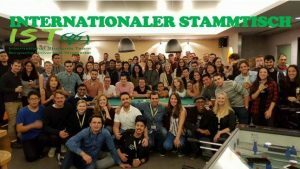 invites you for our weekly International Meeting / Stammtisch at the Uni Kneipe – Campus Bar! MensaBuilding ME 04! Every thursday from 20:00 – 23:00! Have some drinks or dinner with funny students! Share experiences and meet new friends! Everyone interested is welcome!!! You find us always on the right corner where the pool and kicker tables are! !